Tri-Cities Business Association (TCBA), an organization of many businesses in McCaysville, GA, Copperhill, TN and Ducktown TN serve the greater Copper Basin with its wonderful, quaint shops and restaurants. From March through then end of December, tourism is a vital part of the town’s vibrance. In keeping with the Copper Basin Renaissance and McCaysville Downtown Revitalization efforts to bring these beautiful mountain towns forefront in tourism, the TCBA Board decided to change the name of the organization to Copper Basin Business Association beginning in March, 2019. 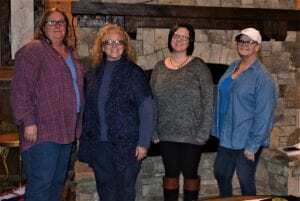 The announcement was made during TCBA’s monthly meeting by President Tamberlyn Tanner, owner of Toccoa River Rustic Decor. Left to Right: Treasurer Mary Stuart, President Tamberlyn Tanner, Secretary Ashley Barker, and Vice President Donna Tresslar. 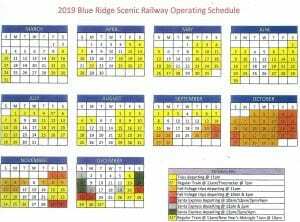 She presented to members the 2019 Blue Ridge Scenic Railroad schedule as well. Serving with President Tanner this year are Vice President Donna Tresslar (Dixie Discount), Secretary Ashley Barker (McCaysville Properties), and Treasurer Mary Ann Stuart (Katz’s New York Deli/Riverview Beanery). The annual Fireworks display will be present near the Fourth of July in McCaysville. Tourists aboard the train will arrive later in the evening to enjoy to spectacular show of lights in the sky. Other events are in the planning stages at this time and will be announced when finalized. TCBA meets the 2nd Tuesday of each month at 5:30 p.m. McCaysville Properties is the host for the meetings. It is located at 169 Tennessee Avenue, Copperhill, TN. For more information on becoming a member in TCBA, email President Tanner at TriCitiesBA@gmail.com.